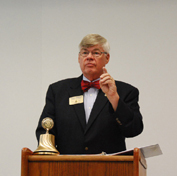 Below is the year of President Kevin Yeargin, 2013-2014. If you would like to go in chronological order, start at the bottom and scroll your way up. 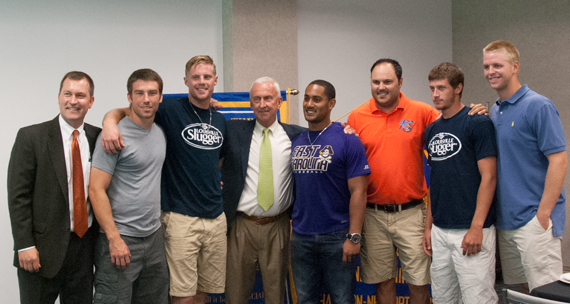 At the July 9th meeting we celebrated the Peninsula Pilots baseball team. The Pilots are an amateur team made up of some of the best university baseball players in the country, playing during the summer while they are not in school. Shown here are Peninsula Rotary President Paul Szabo, team members Kyle Kampf, Taylor Ostrich, team owner Henry Morgan, player Garrett Brooks, team manager Jeff Scott, and players P. J. Higgins and Alex Close. Also attending and speaking to us was the Pilots broadcaster Frank Edgar. 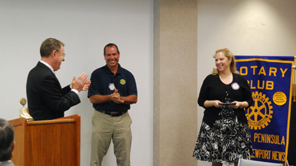 June 18th was military appreciation day, organized by Debra Flores. 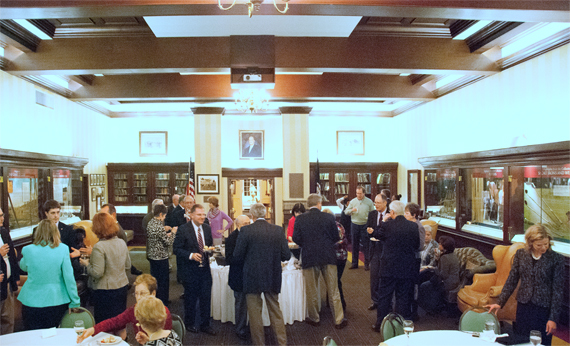 With a larger-than-usual crowd, veterans in our membership spoke about their military memories and observations. Then Colonel Michelle Rose spoke first about the National Guard in Virginia, and then about her own experiences and insights during her deployment in Afganistan. It was a meeting that was both moving and informative. The Peninsula Rotary Club's Thomas Nelson Community College scholarship, now oriented toward workforce development, this year was awarded to T. J. Tillman, a welding student. T. J. visited the club on June 4th. He plans on a career in either underwater welding or nuclear welding. 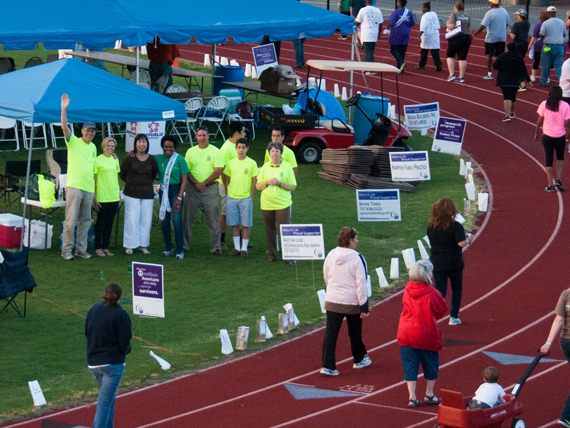 The Virginia Peninsula Rotary Club participated in the American Cancer Society's "Relay for Life" event at Darling Stadium in Hampton. Staffing the tent during the sunset shift--and conspicuous in their neon teeshirts--were John and Mary Ellen Frantz, Elizabeth McCoury, Debra Flores, and the entire Yeargin family. Ray Spencer dropped by for some photographs. The April 16th meeting was away from our regular meeting site, and instead was held at the Sarah Bonwell Hudgins complex in Hampton. We learned about their facilities, their organizations including the tenant organization Eggleston Services, the work they do, and the services they make available. 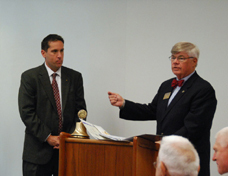 Sometimes when the District Governor visits the Peninsula Rotary Club, we put him to work. 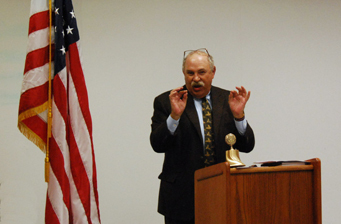 On April 2nd DG Chuck Arnason performed two tasks. First he and Jim Pierce (the club's Foundation Chair) congratulated Stan Glasofer as the club's latest Paul Harris Fellow. Stan, not a member, is a friend of Abe Firestone, and Abe made him a Fellow. Stan has another connection with the club--he is the son of Seymour Glasofer, a popular and long-time member in the club's earlier years. Next, DG Chuck presented Cap and Linda Neilson with a crystal recognizing them as members of the Paul Harris Bequest Society. 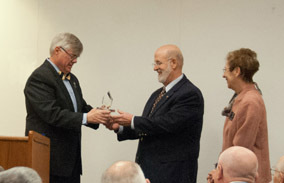 The Bequest Society is made up of those who generously include The Rotary Foundation in their wills. 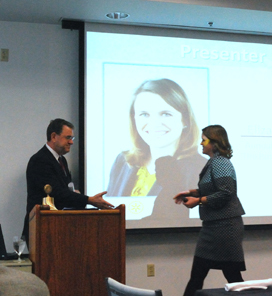 The March 19th meeting was Career Day 2014. 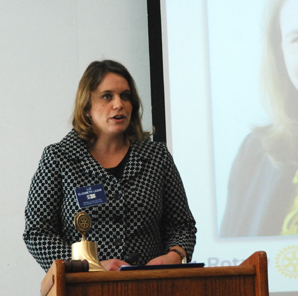 With a room full of high school students--from our Interact Club at Peninsula Catholic High School--Rotarians shared their experience and advice about the students' futures. Presided over by Joe Johnson, questions from the students were announced, and then the Rotarians and high schoolers discussed the questions at individual tables. Young and old alike gained from the hour's exchange. Several of the Peninsula Club members took part in the "Read Across America Day" at Cooper Elementary School. 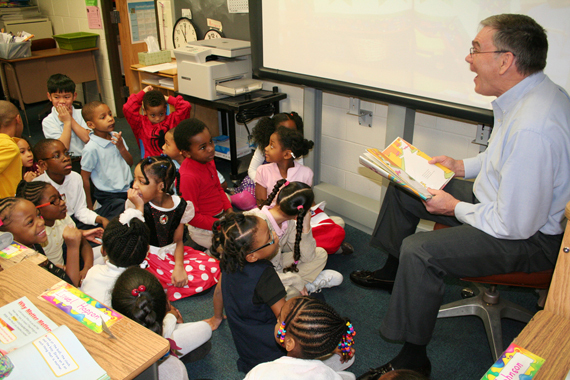 Here Danny Carroll reads a Dr. Seuss book to a group of appreciative listeners. Our club has partnered with Cooper Elementary in several ways, including the Mayor's Book Club and especially by supporting the Star Achievers Academy, a YMCA school support activity at Cooper. 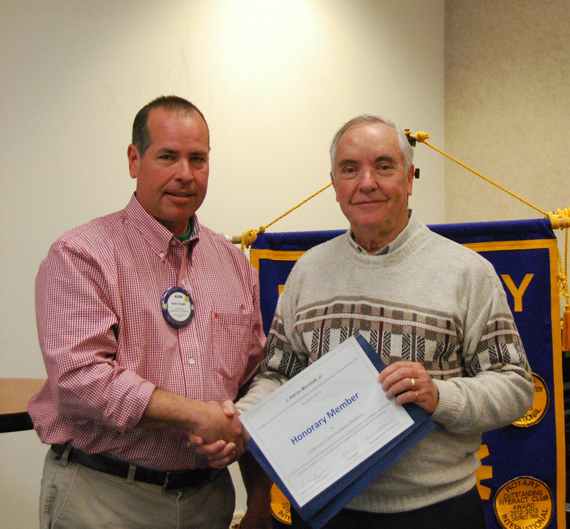 At our March 5th meeting Adrian Marshall, a long-time active member, was declared an Honorary Member and invited to come back any time. 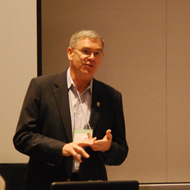 On February 28 and March 1 in Reston, Virginia there was a multi-district Presidents-Elect Training Seminar ("PETS"). Attending from the Peninsula Club were President-Elect Paul Szabo, President-Elect Nominee Pat Resto, Area Governor Elect John Frantz, District Governor-Elect-Nominee-Designate Diane Hagemann, Past District Governor Jim Pierce, and Immediate Past District Governor Cap Neilson. This was the largest representation of any club of all the districts involved. 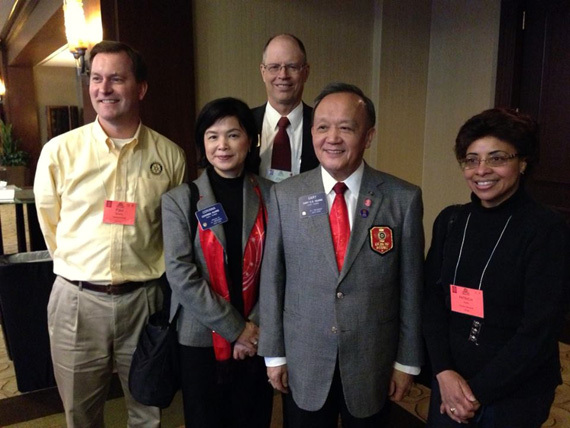 A special honor was the attendance of the President-Elect of Rotary International, Gary Huang and his wife Corina. Pictured above are PE Paul, Corina, AGE John, RIPE Gary, and PEN Pat. On our Charter Nights, it is customary to give out pins for elevated levels of Paul Harris Fellowships. 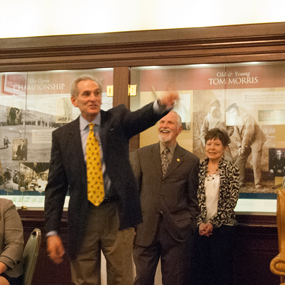 Abe Firestone is now a Paul Harris Fellow plus 4. Art Dister is plus 2. Nhu Yeargin is plus 1. Kevin Yeargin is plus 4. Susan Strehle is plus 1. Pat Resto is plus 3. Diane Hagemann is plus 3. And Drew Hagemann is plus 2. 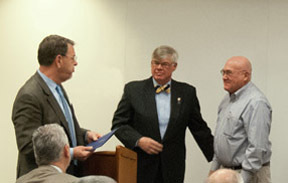 At Charter Night Lanny Hinson, the last of the charter members of the club, was given a certificate for honorary membership in the club, and another recognizing his 38 years of perfect attendance. Then several members reminisced about Lanny. Jeff Mendelsohn gave an animated appreciation of both Lanny and the club as a whole. 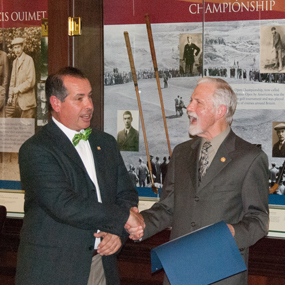 This year's Virginia Peninsula Rotary Club Charter Night was once again held in the noble setting of the golf museum at the James River Country Club. Charter Night is when we celebrate the founding of the club in 1976. The Peninsula Club sponsored three high school students to attend RYLA (Rotary Youth Leadership Awards) February 15th through 17th. 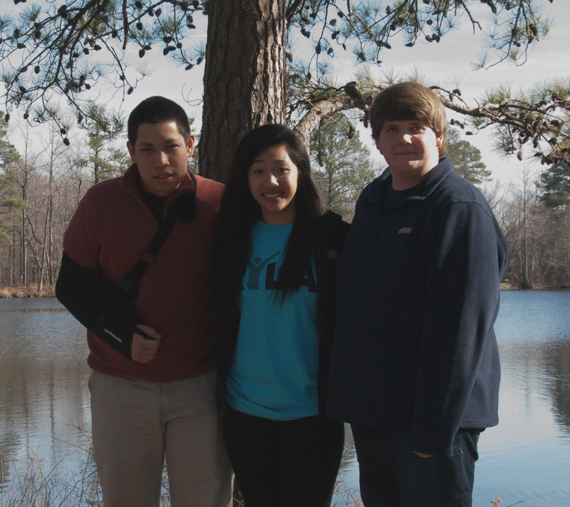 Here they are--Sean Quachyeargin, Terrie Dinh, and Connor Burke--at RYLA's bucolic Sussex County location. 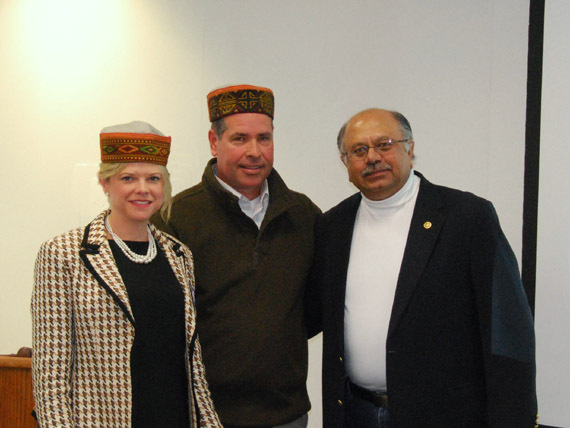 On February 5th we had two visiting Rotarians from the Shimla area of India, Agit Butail and Derek Madan. In this photo Agit, in accepting a club banner from us, gave Elizabeth and President Kevin special hats from his native country. Betsy Edwards and Amy Ritchie of An Achievable Dream stopped by to give us a check for over $37,000.00. They are shown here with Pat Resto, the club's Tennis Ball Chair this year, and President Kevin. The money is our portion of the proceeds from the 2013 Tennis Ball, co-sponsored by An Achievable Dream and the Virginia Peninsula Rotary Club. We get back a third of what we bring in, and this year our club was responsible for almost $112,000 in sponsorships, auction items, and donations. In all, the Tennis Ball raised $480,000 for An Achievable Dream. 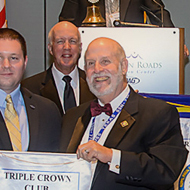 Geoffrey Robert Grau, a history major at Christopher Newport University, is very active in civic and volunteer activities outside the university. 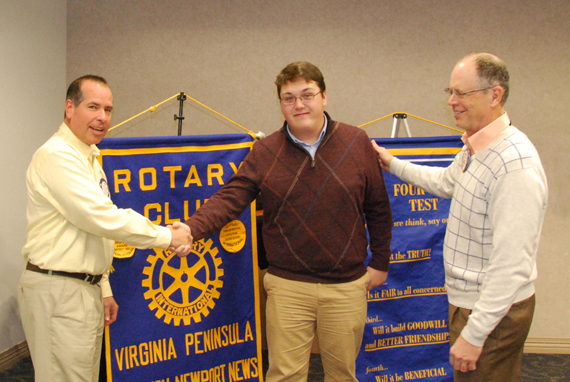 He is also the 2013-2014 recipient of the CNU Virginia Peninsula Rotary Club Endowed Scholarship. He paid the club a visit on January 8th. The scholarship this year was $7,200.00--the amount varies from year to year, depending on the earnings from the endowment. 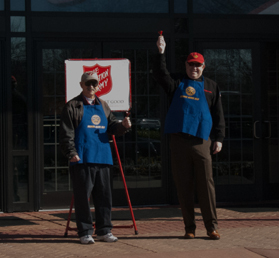 On December 18th, in cool air but under an unusually bright sun, club members worked successive one-hour shifts throughout the day ringing the bell for the Salvation Army at two locations. 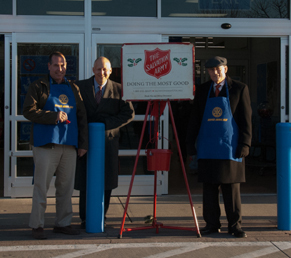 Shown at the left at the Hampton Wallmart are Kevin Yeargin and Charlie Edmonson, with Jeff Clemons about to leave after being relieved. On the right at Patrick Henry Mall are Susan Strehle's husband Steve, and Howard Waters, perhaps hamming it up a bit. 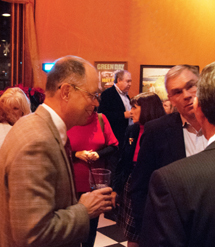 On December 17th we had an "after hours" social at the Park Lane Tavern in Peninsula Town Center. 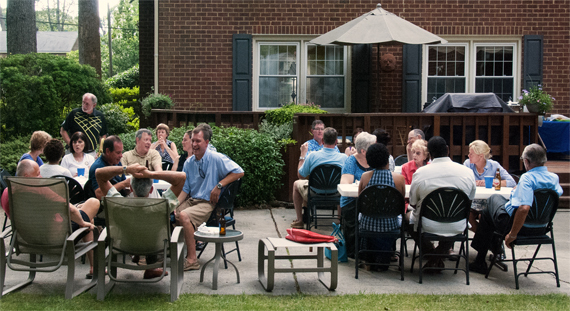 There was good food, good drink, and good fellowship. For our first meeting in December, historian John Quarstein--always a favorite with the club--discussed historical Christmas celebrations in Hampton Roads. 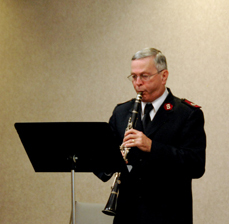 And as members were coming in before the meeting started, Kim Feinauer filled the room with his Christmas music. November 16, 2013 was the date for the 21st annual Achievable Dream Tennis Ball, our fund raiser and the biggest social event on our calendar. 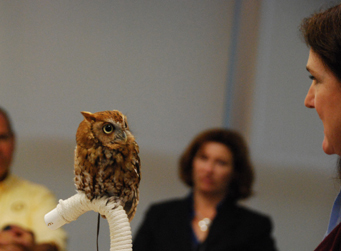 In support of An Achievable Dream and its schools, it was another success this year, with the largest attendance ever. Over a thousand tickets were sold, and the newspaper reported that over 900 were present. For more photos go to our photo albums page and click on this event. You can also find out more about the Tennis Ball and An Achievable Dream on the "Club Projects" page. 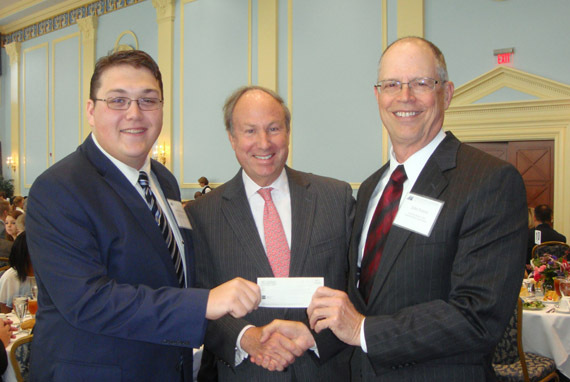 This photo shows John Frantz and Paul Trible with Geoffrey Grau, the 2013 scholarship recipient of the Peninsula Rotary Club Endowed Scholarship Fund. Mr. Grau is a history major whose interest in history was stimulated at an early age by participation in the Williamsburg Fifes and Drums. For more information on the scholarship go to our "Club Projects" page. 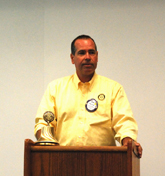 November is Rotary Foundation month, and Jim Pierce--our Foundation Chair--has been providing meetings about The Rortary Foundation. 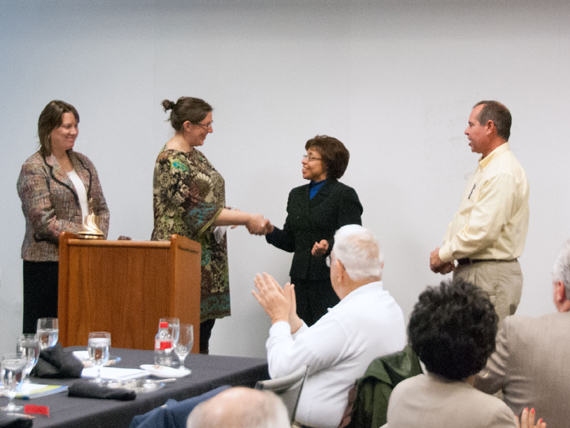 The November 13th meeting started off with Diane and Kevin inducting Diana Gulata into the club, and then Jim introduced Liz Lazar, the Annual Giving Officer from TRF in Evanston. 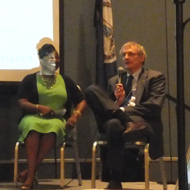 On October 23rd we had an "off-site" meeting at the ARC of the Virginia Peninsula, newly rechristened Versability, in Hampton. Versability is--with great success--finding innovative ways of giving those with disabilities valuable and productive work that helps them earn a proud place in society. We saw a "clean room" where workers made products for the health industry, young workers disassembling electronic equipment for recycling, high-tech digitizing of industrial x-rays, and other activities in this bustling center. 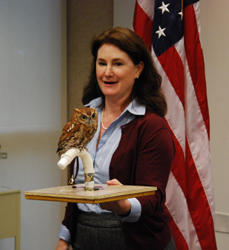 Paige Hayhurst of the Virginia Living Museum joined us October 9th, bringing some information and news of the VLM, and she also brought a screech owl to amuse and intrigue us. 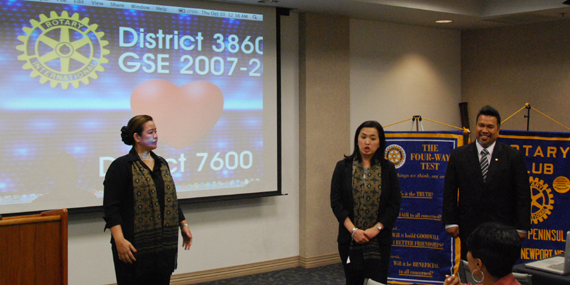 In 2007 a GSE team from the Philippines visited our District and our club. Three of them came back October 9th for a visit to say hello. 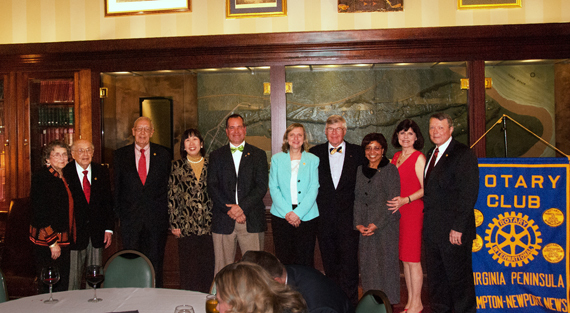 All are now Rotarians. 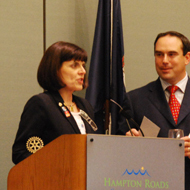 Considering that a member of our club was not District Governor this year, the Virginia Peninsula Rotary Club had a lot of its members prominently featured at this year's District Conference. To see more, go to the photo album by clicking here. 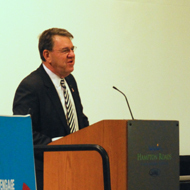 At the 2013 District Conference, Jim Pierce was awarded a high honor--the Citation for Meritorious Service. 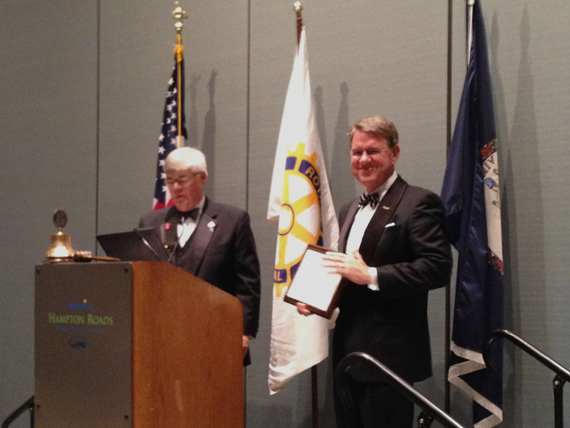 The Citation is given for extraordinary service to the Rotary Foundation over an extended period--and those of us who have been watching Jim are not surprised at this recognition. 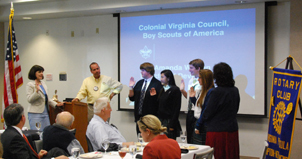 There was an abundance of youth at our September 25th meeting--the new officers of our Interact Club at Peninsula Catholic High School joined us to be sworn in. 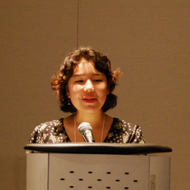 In the glare--and odd color--of a slide from the upcoming Boy Scouts talk, Diane swore in first the vice president, secretary, treasurer, and historian of the club; then she swore in co-presidents Blakely and Jordan. 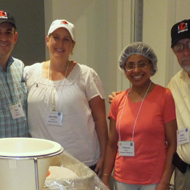 July 30th was a big day for the club personnel. 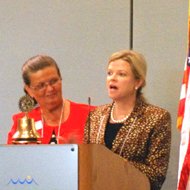 PDG Cap and President Kevin welcomed our newest member, Christine Felts. 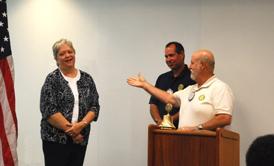 Jim Pierce and Kevin congratulated our newest Rotary Foundation Benefactor, Pam West. 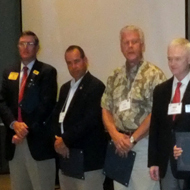 And seven members were recognized for achieving new levels as multiple Paul Harris Fellows. July tenth was an eventful meeting. Kevin Yeargin for the first time conducted a meeting as President; District Governor Chuck Arnason made his official visit to our club and talked to us about Rotary International, District 7600, and our club; and Shawn Avery was inducted into the club by DG Chuck--all this in front of a room almost overflowing with members. 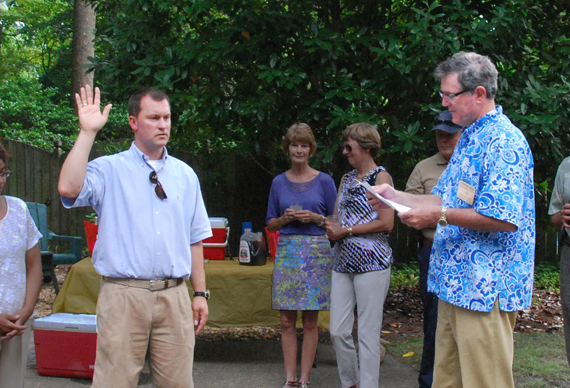 On June 30th we had our installation of officers gathering in the home and lush garden of Kevin and Nhu Yeargin.